‘Practical Guide to the Operational Use of the M203 Grenade Launcher’ and ‘Glock Handbook: An Operational Guide to the Glock Handgun’ are two of the many newly released titles of firearm handbooks and instructional manuals by author Erik Lawrence. 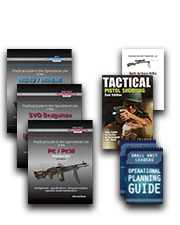 Intended as both reference guides for users and training material for instructors, these books offer the fundamentals of firearm education in a comprehensive format. Lawrence provides introduction, description and background details for each firearm, and shares his expert knowledge on safety measures, marksmanship, weapon handling, cleaning and maintenance, assemblage, firing positions, malfunction assessment, and training tips. Lawrence’s books cover an impressive list of firearms and weaponry including: the SVD sniper rifle; the Beretta, Makarov, and Tokarev pistols; the AK47 rifle; the Remington 870 shotgun; and the RPG-7 grenade launcher. His motivation to write these books was based on the lack of access to updated, current manuals as well as his desire to share the wealth of knowledge that he developed during his ten years in Special Forces with the U.S. Army and through years of perfecting his own training systems. The books in these series are published in eBook format by eBookIt.com and are now available at popular online retailers including Amazon.com, Barnesandnoble.com, and Apple’s iBookstore. Review copies of Lawrence’s books are available to media contacts upon request. Author Erik Lawrence is available for interviews. The author of over twenty-five books on tactics and firearms, Erik Lawrence is the Managing Member of Vigilant Security Service, LLC. Lawrence served over ten years in the U.S. Army Special Forces and was previously the Managing Member for Blackheart International, LLC and Mid-Atlantic Training Resources. Lawrence was a team member, sniper, and instructor on Special Forces Close Quarter Battle teams operating in numerous theaters of operation. Since leaving the military, Lawrence has worked as an instructor and security professional to government agencies and private companies throughout the GWOT. Since 2010, eBookIt.com (based in Sudbury, Massachusetts) has helped thousands of authors and publishers get their books converted to ebook format, and distributed to all the major ebook retailers, including Amazon.com, Barnesandnoble.com, Apple iBookstore, Kobo, Sony Readerstore, Ingram Digital, and Google eBookstore.